CONGRATULATIONS to all Winners & Participants of 6th Mandpeshwar Civic Federation State Ranking Carrom Tournament 2019-2020. Thanks to all Carrom Fans, Well Wishers & Officials help to make EVENT successful ! 3rd Mulund Gymkhana State Ranking Carrom Tournament 2019-2020 will be held between Dt. 25th to 27th May, 2019. At the Venue : Mulund Gymkhana, Navghar Road, Mulund (East), Mumbai - 400081. | MCA will accept the entries till 15th May, 2019 at the office of the Maharashtra Carrom Association, Worli, Mumbai. MULUND GYMKHANA, Mulund (East), Mumbai is organizing 3rd MULUND GYMKHANA MAHARASHTRA STATE RANKING CARROM TOURNAMENT 2019-2020 under the aegis of Maharashtra Carrom Association & Mumbai Suburb District Carrom Association. Committee would like to invite you all Carrom Lovers, Fans to enjoy the CARROM GAMES. Join us LIVE at the Venue to experience intense CARROM Play. Venue : Mulund Gymkhana, Navghar Road, Mulund (East), Mumbai - 400081. Date : 25th to 27th May, 2019. 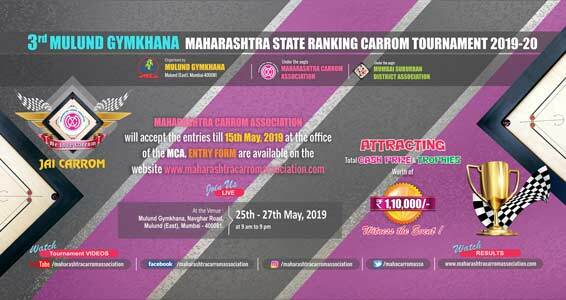 MCA will accept the entries till 15th May, 2019 at the office of the Maharashtra Carrom Association, Worli, Mumbai.